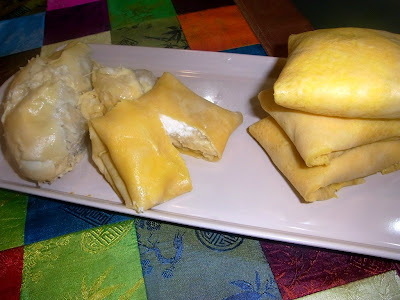 Durian eaters have gone into this durian crepe frenzy. I normally have this thin pancake filled with a variety of savoury and sweet fillings - nuts, fruits, ice-cream, cheese, beef - but never with durian. So I figured why not give it a try. After all, it is the durian season (I guess my durian panna cotta had to wait). So I got myself some musang king durians (this must be one pricey fruit crepes ever)...the fleshiest and creamiest ones, and started whipping up things. The result: A delightful combination of that rich fruit pulp and custardy cream. Best eaten chilled. For as long as I can remember, there has always been inequality in the workforce. Although this situation is a lot better than what it was, it is still pretty clear that women get treated differently than men. I am currently a college student taking classes here in Malaysia for a year before I return back to the States. Last semester, a class I took, International Human Resource Management, went into gender inequality in the work force in details. The class talked about how employees get chosen to go abroad to work. It was pretty evident that a majority of employees chosen to go abroad were males and the question was why? The answer that I am about to give you guys is pretty obvious and probably will not shock any of you. People have it in their minds that males have a better chance of adapting to living abroad than women do, partially because of the place that those employees may be working.